What have we be sewing? Well here's one thing I made recently--a tote bag made from this floral fabric and grey canvas. 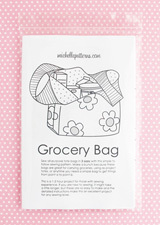 This is the small size in the Grocery Bag pattern, but with the bag body pieces divided into two fabrics. roxanaperdue turned an old pair of jeans into a bag for her climbing gear using the Grocery Bag pattern. sooz.made wears the lovely denim skirt she made using the A-Line Pocket Skirt pattern. It looks like she made the front from two pieces of fabric, and then highlighted the seam with topstitching. It looks awesome and dividing the front is always an option if you don't have quite enough fabric for cutting it as one piece. 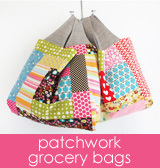 katiebugquilts stitched up some new market bags for the summer using the Grocery Bag pattern. If she doesn't use it for groceries, it looks like her cute little dog might want to use it as a carrier. simplestitchesaz filled a custom order for a zipper pouch and added her own special zip pull to a tall size Zip Pouch. onceuponadonkey made a pink patchwork moon for a Mother's Day gift. See this post for info about making these moons and a pattern piece. loriluvs2sew cleverly covered a scratch on her vintage Singer sewing machine with a Rose Pincushion Cuff. 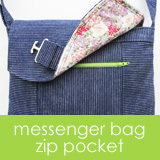 lisajanlovestoquilt made this fantastic zipper bag using the Double Zip Tool Pouches pattern. handmadehazel busted a move on a her stash and whipped up this polka dot and nautical print bag using the Grocery Bag pattern. It's always nice to use up some of the fabrics that linger longer than we planned (then we can feel justified in buying more! ).